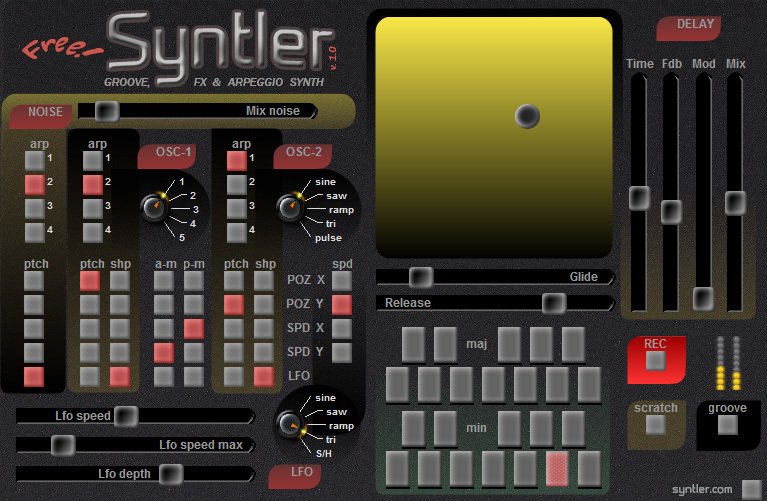 Syntler is a groove and arpeggio synth, playable with a joystick. Move the joystik and play the virtual keybord or MIDI. MIDI keys 36 – 47. Key velosity (0 – 63) – minor, (64 – 127) – major. For scratch and fx play, press the “scratch” button. For groove play, press the “groove” button, then click “REC” and move the joystik (after 1 bar light metronom). 3 oscilators: 2 tones oscilators, noise oscilator. Unique joystik control with speed sensitivity.